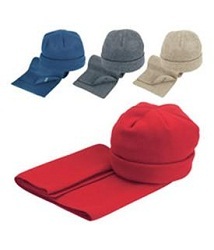 How about giving some warm fleece hat and scarves away this winter? Ideal as the perfect business gift,our Hat and Scarf with Logo could have your company brand name and logo clearly visible on both the hat and the scarf, and whilst remaining highly fashionable in the cold and frost! Our Hat and Scarf with Logo set is a classic, hat and scarf set made of quality fleece. For a FREE QUOTE please fill in our contact form regarding our Hat and Scarf with Logo and we'll be able to help you.